Putin and Poroshenko attend talks in Minsk as fighting escalates in Eastern Ukraine. Russian President Vladimir Putin and Ukrainian President Petro Poroshenko met in Minsk, Belarus, on Tuesday for the first time since fighting broke out—and as fighting worsened—in Eastern Ukraine. The meeting in the Belarusian capital of Minsk came as Ukraine said it had captured 10 Russian soldiers in eastern Ukraine and shelling spread to a new front in the country’s southeast. Ukraine has repeatedly accused Russia of supporting and arming the pro-Russian rebels fighting government troops, which Russia always denies. … Under pressure to seek a negotiated settlement and not a military victory, Poroshenko said the purpose of his visit was to start searching for a political compromise and promised that the interests of Russian-speakers in eastern Ukraine would be taken into account. Putin devoted most of his opening remarks to trade, arguing that Ukraine’s decision to sign an association agreement with the 28-nation EU would lead to huge losses for Russia, which would then be forced to protect its economy. 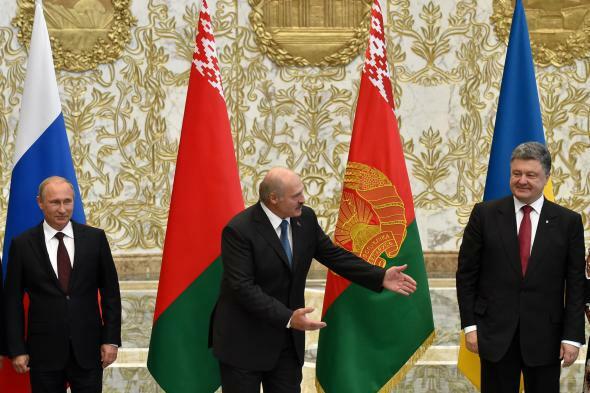 Russia had been counting on Ukraine joining a rival economic union it is forming with Belarus and Kazakhstan. Putin’s focus on trade is telling, since the conflict in Ukraine arguably began when then-president of Ukraine Viktor Yanukovych was told by the Kremlin not to sign the EU association agreement. After a revolution ousting Yanukovych, the annexation of Crimea, and the creation of the current crisis in the East, Ukraine has since signed the agreement and is expected to ratify it in September. Given that Poroshenko affirmed his commitment to ratification at a meeting with EU High Representative for Foreign Affairs and Security Policy Catherine Ashton on Tuesday, and that Russian news agency RIA Novosti is quoting a Russian defense ministry source as saying that the captured Russian troops came into Ukraine “by accident,” it is perhaps unlikely that resolution to either the trade or military conflicts will be found in Belarus. Still, the two are meeting for their first-ever bilateral talks together behind closed doors Thursday afternoon. For his part, the president of host country Belarus, Alexander Lukashenko, offered that both Russia and Ukraine should “discard political ambitions.” Belarus is commonly referred to as Europe’s last dictatorship—and is also, according to Carnegie Endowment for International Peace scholar Balázs Jarábik, basically the only rational regional actor involved in the current conflict.